Create Fun or Challenging Courses in Your Driveway! The perfect companion to the Chalk City Road Maker. 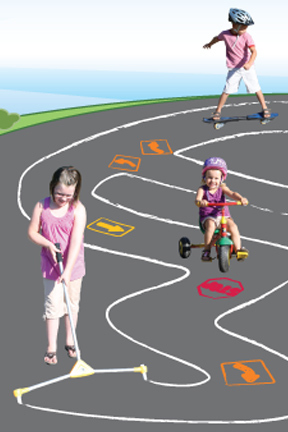 Use these high quality stencils to enhance the roads your kids draw, or play with them alone to create fun and challenging obstacle courses without the pathway. They work with standard sidewalk chalk, so they can be used anywhere it is safe to draw. 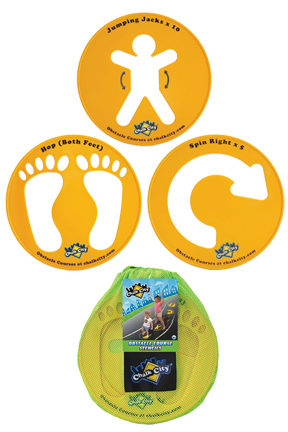 This set includes three different stencils that allow children to draw six different obstacles by flipping or just using portions of them. They can create a spot that tells them to hop on both feet, hop on one foot or the other, do jumping jacks, or spin around to the left or right. Your kids will have fun arranging the obstacles in different patterns to create an unlimited number of courses. The road maker is tons of fun all by itself, but when you add these fun shapes and directional cues it becomes a whole different world of play. Set up different road blocks along the path, so children have to stop and think, then perform a specific task. Kids can use these to have foot races, or they can be used with riding vehicles where they have to hop off at each stop to complete the specified move. Each large stencil is made from thick and durable plastic so kids can be rough with them and you don't have to worry about breakage. The simple, oversized designs are easy to understand and duplicate perfectly, so children naturally know how to use them, and what they are supposed to do when they see them. Thanks to the larger openings in these stencils, it's easy for kids to trace them using chalk, and the result is big, bold icons for the ultimate self made obstacle course. Let their imaginations run wild as they add details to the cities and roads they draw, and get ready for all of the games and challenges the devise using these stencils. Each one can be flipped over and used on either side, and they wash clean with regular old water. This set comes complete with a bag for storage and includes three obstacle stencils, and several pieces of chalk. 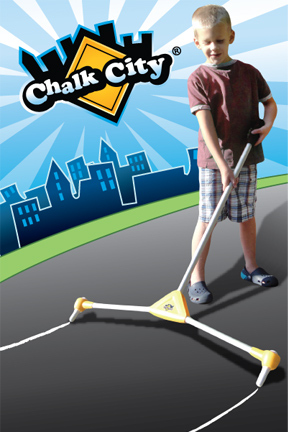 Use and combine with the other chalk city toys for the endless hours of outdoor playing. Also available: The Road Maker and the Road Sign Stencils. Order Yours Today! Chalk City Obstacle Course Stencils - A high quality toy for endless hours of outdoor fun. 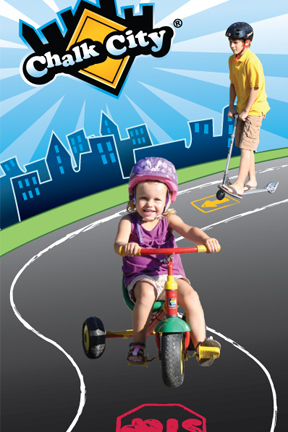 This easy to use stencil set will allow kids to draw obstacles on the driveway to create challenging courses. Order Yours Today!